Fabric shops sell many fusible adhesives for bonding fabrics. Sometimes accidents happen, and you end up with an adhesive stuck to your iron. No matter what went wrong in the bonding process, with come careful effort, you can remove the adhesive from your iron’s soleplate. Empty any water from your steam iron. Set the iron to the cotton or high-heat setting. Squirt a 2-inch strip of iron cleaner (available at fabric stores and most big-box stores that have a fabric department) onto a terry cloth rag. The rag must be 100 percent cotton, with no synthetic blends, to avoid melting the cloth during the high-heat cleaning process; check the tag on an old terry tea towel or face cloth for fabric content. Cover the ironing board with an old towel to protect the board’s surface. Lay the terry rag flat, with the cleaning-agent-side up on the covered ironing board. Rub the hot iron in circular motions over the cleaner, as if ironing the rag. Move the iron to a clean portion of the rag. Rub the hot iron over the clean area to remove the iron cleaner from the soleplate. Tip the iron slightly in all directions to remove any cleaner from the iron's edges. Check that the iron’s underside is free of iron-on bond marks. Repeat the cleaning process, if necessary. Allow the iron to cool completely. Wipe the iron’s soleplate and upper edges with a clean rag to remove all traces of the cleaning product. Use cotton swabs to clean any remaining iron cleaner from the iron’s vent holes. Use iron cleaner regularly to clean starch, melted synthetics, and patch glue from your iron and reduce iron "drag." You may notice smoke while using some iron cleaner products. This is normal. 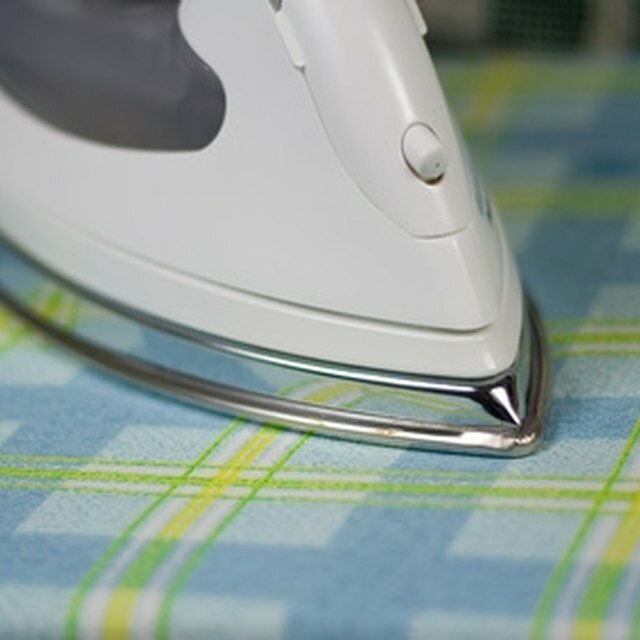 Iron cleaner left on your iron may result in spotted or damaged fabrics. When using any brand of iron cleaner, refer to the instructions and safety precautions on the label.